| Vegan MoFo 2012 | Day 4 | corrina, darling! Much thanks to everyone who left suggestions for my grocery list! It seems I forgot quite a few important things. The other night I made the Cauliflower Pesto soup in, like, 20 minutes. Even if it had tasted mediocre it would have been worth it to have something healthy and from scratch cook up in such a short, mom-friendly amount of time, but it tasted awesome. Like Cauliflower frackin’ Pesto in my mouth, ya’ll. I’d post my low quality Instagram photo, but I can’t bring myself to muck up your feed with all those pixels. This is a true story: I loaned AFR to a friend of mine for like 2 weeks, not thinking much of it. By the end of it I was pretty much camped in her front yard waiting for her to come home and give it back. I totally rely on it for fast healthy stuff. Also, your pro tip re: cereal sogginess made me laugh! 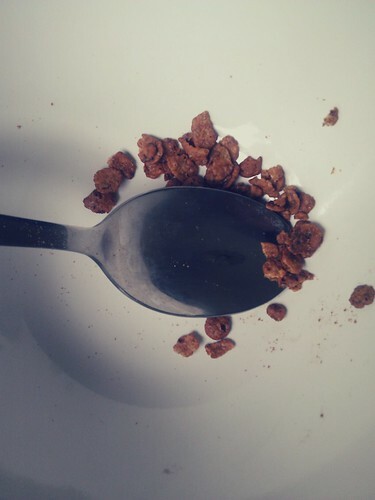 Cereal tends to be my meal of choice when I want something quick. You want non-soggy cereal with milk? Get Heritage O’s, it’s like eating rocks. Haven’t made that recipe yet, but anything with pesto is a winner in my books. You are cereal-wise: I almost always prefer cereal dry. Soggy wheat-y stuff is not my thing. Cauli-pesto, I must make this soup and STAT! 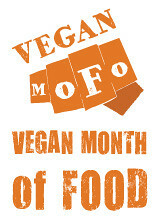 Participating in the 2012 Vegan Month of Food.